Always leave the blue pasteboard card box and red pasteboard cardbox nonchalantly around as this psychologically registers the face that two decks are constantly in use. 'When doing effect //2, place blue deck of cards in your pocket surreptitiously. Only use poker size cards as they fit snugly and noise will be avoided. Other effects possible, such as using cigarettes or roll of bills, or a jumping snake, etc. , instead of having box empty for effect #2. When finishing effect #2, place red deck inside leather case and away you go. Many other effects are possible. Have fun! A regular deck is used. Sixteen cards all the same are loaded in base. After the deck has been shuffled, hold deck in left hand. Pick up stand and place it in left hand directly over shuffled deck.. Second or third finger is curled up under stand alongside edge of sixteen cards. After you have talked about the different colors, etc. take the stand away with right hand, thus adding the sixteen cards to deck. We have proved this to be an intensely mystifying trick, and if any fault can be found in the trick, it is the fact that it is so easy to perform— but don't let that influence you. Do it and let the audience be the judge. 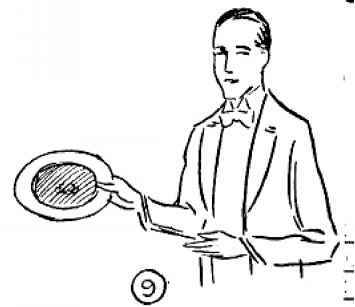 Suggested forms of Patter: nAlthough I now use a deck of cards, this is not a card trick. I first need a subject. Will you assist, Sir? Thank you." (Fan cards and shuffle, etc.) You know as well as I do that hypnotism is illegal in this state, Therefore, if I should hypnotize you and put you to sleep, or have you perform different tests, I would be breaking the law. But I can hypnotize you to the extent of controlling your very thought and that Is what I intend doing. The deck of cards has been freely shuffled and I now deal out 16 cards. You choose one and take careful note of its value and suit. We now mix your card with the rest of them, so that we have 16 cards, one of which is yours. "The next phase of this experiment is- to separate the 16 cards into groups of four. I warn you that those colors have not been picked haphazardly. There is a reason for each color and its particular position on the Stand. You will apparently have free selection, but regardless of how you try to oppose me mentally, the last card left on the stand will be your card. This is a real :gem" for impromptu or off-hand or press demonstration and I strongly recommend it. Five different colored cards and five small envelopes, such as used for paying salaries, are used. Spectator directed to decide on one of the colors —think of it 1/2 minute. Then to pick that card up and turn it over — face down or upside down. Then place all the cards, each card in a separate envelope. This is done while performer turns his back. Performer takes envelopes, holds them to his forehead, and "mentally" discovers which color was selected! USED IT TO MYSTIFY THE MANAGER AND PUBLICITY MAN OF THE EVENT — REPEATEDLY.